Reading and share top 2 famous quotes and sayings about Christian Legacy by famous authors and people. Browse top 2 famous quotes and sayings about Christian Legacy by most favorite authors. 1. 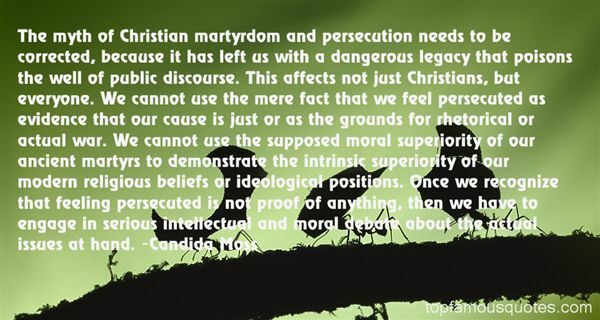 "The myth of Christian martyrdom and persecution needs to be corrected, because it has left us with a dangerous legacy that poisons the well of public discourse. This affects not just Christians, but everyone. We cannot use the mere fact that we feel persecuted as evidence that our cause is just or as the grounds for rhetorical or actual war. We cannot use the supposed moral superiority of our ancient martyrs to demonstrate the intrinsic superiority of our modern religious beliefs or ideological positions. Once we recognize that feeling persecuted is not proof of anything, then we have to engage in serious intellectual and moral debate about the actual issues at hand." 2. "For the normative self-understanding of modernity, Christianity has functioned as more than just a precursor or catalyst. 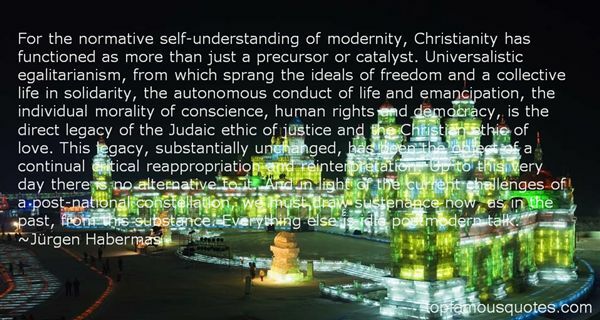 Universalistic egalitarianism, from which sprang the ideals of freedom and a collective life in solidarity, the autonomous conduct of life and emancipation, the individual morality of conscience, human rights and democracy, is the direct legacy of the Judaic ethic of justice and the Christian ethic of love. This legacy, substantially unchanged, has been the object of a continual critical reappropriation and reinterpretation. Up to this very day there is no alternative to it. And in light of the current challenges of a post-national constellation, we must draw sustenance now, as in the past, from this substance. Everything else is idle postmodern talk." I'd sit on a horse and forget I was even sick."